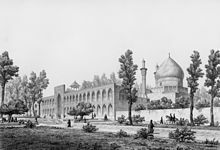 The Safavid dynasty had its origin in the Safavid order of Sufism, which was established in the city of Ardabil in the Azerbaijan region. 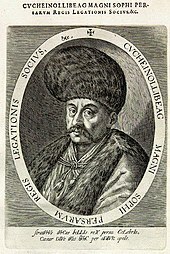 It was of mixed ancestry (originally Kurdish but during their rule had intermarried with Turkomans, Georgians, Circassians, and Pontic Greek dignitaries). 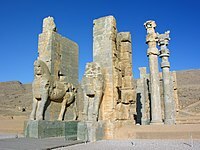 From their base in Ardabil, the Safavids established control over parts of Greater Iran and reasserted the Iranian identity of the region, thus becoming the first native dynasty since the Sasanian Empire to establish a national state officially known as Iran. ^ Mikaberidze, Alexander (2011). "Treaty of Ganja (1735)". In Mikaberidze, Alexander. 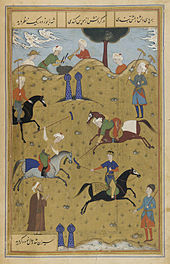 Conflict and Conquest in the Islamic World: A Historical Encyclopedia. ABC-CLIO. p. 329. ISBN 978-1598843361. ^ Rizvi, Sajjad (Summer 2009). 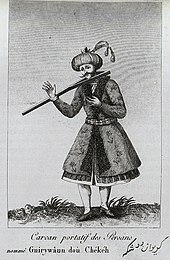 "Mulla Sadra". 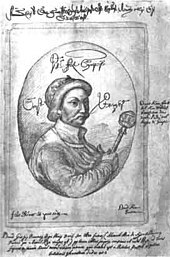 In Zalta, Edward N. The Stanford Encyclopedia of Philosophy. 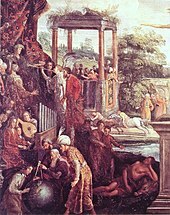 Shāh Abbās the Great or Shāh Abbās I of Persia was the 5th Safavid Shah (king) of Iran, and is generally considered the strongest ruler of the Safavid dynasty. 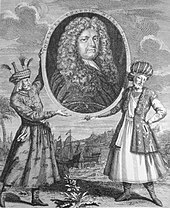 He was the third son of Shah Mohammad Khodabanda. 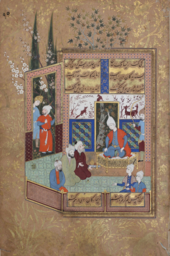 Tahmasp I was an influential Shah of Iran, who enjoyed the longest reign of any member of the Safavid dynasty. 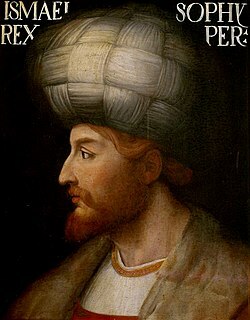 He was the son and successor of Ismail I.
Ismail I, also known as Shah Ismail I, was the founder of the Safavid dynasty, ruling from 1501 to 23 May 1524 as Shah of Iran (Persia). 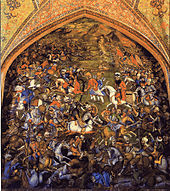 The Battle of Chaldiran took place on 23 August 1514 and ended with a decisive victory for the Ottoman Empire over the Safavid Empire. 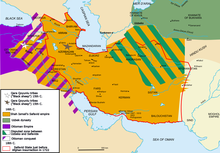 As a result, the Ottomans annexed Eastern Anatolia and northern Iraq from Safavid Iran. 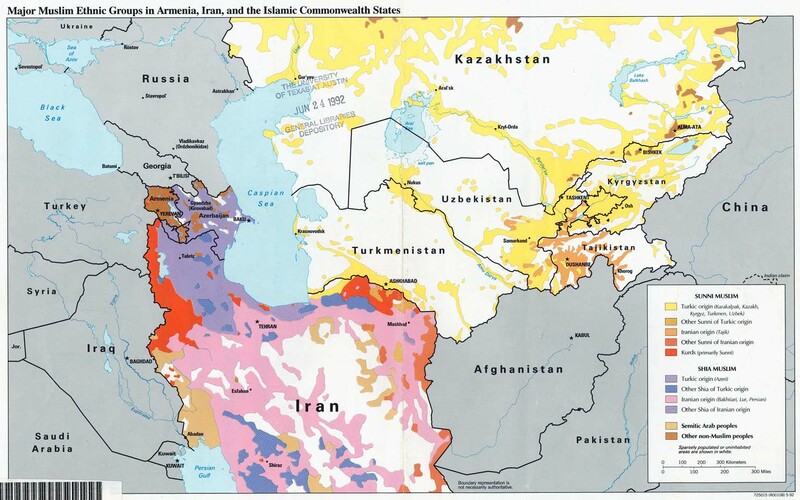 It marked the first Ottoman expansion into Eastern Anatolia, and the halt of the Safavid expansion to the west. The Chaldiran battle was just the beginning of 41 years of destructive war, which only ended in 1555 with the Treaty of Amasya. 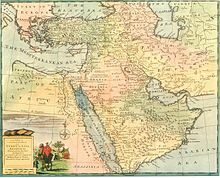 Though Mesopotamia and Eastern Anatolia were eventually reconquered by the Safavids under the reign of Shah Abbas the Great, they would be permanently lost to the Ottomans by the 1639 Treaty of Zuhab. 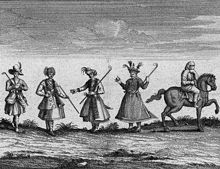 Qizilbash or Kizilbash were a wide variety of Shi'i militant groups that flourished in Iranian Azerbaijan, Anatolia and Kurdistan from the late 15th century onwards, some of which contributed to the foundation of the Safavid dynasty of Iran. 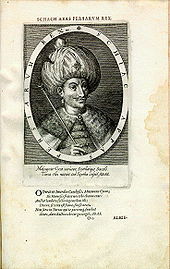 Ismail Mirza later known by his first dynastic name of Ismail II was the third Safavid Shah of Iran, ruling from 1576 to 1577. 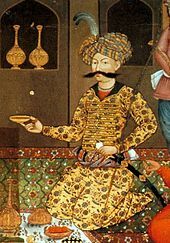 Mohammad Khodābandeh or Khudābanda, also known as Mohammad Shah or Sultan Mohammad, was Shah of Persia from 1578 until his overthrow in 1587 by his son Abbas I. 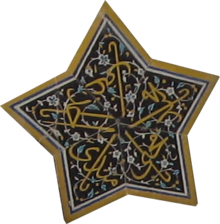 He was the fourth Safavid Shah of Iran and succeeded his brother, Ismail II. 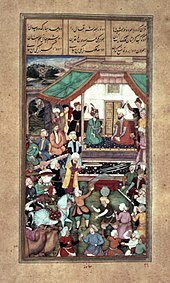 Khodabanda was the son of Shah Tahmasp I by a Turcoman mother, Sultanum Begum Mawsillu, and grandson of Ismail I, founder of the Safavid Dynasty. Allahverdi Khan was an Iranian general and statesman of Georgian origin who, initially a gholām, rose to high office in the Safavid state. 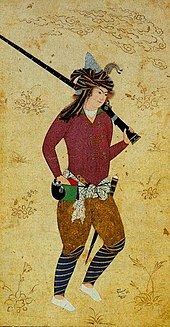 Safavid art is the art of the Persian Safavid dynasty from 1501 to 1722, in present-day Iran and Caucasia. It was a high point for the art of the book and architecture; and also including ceramics, metal, glass, and gardens. 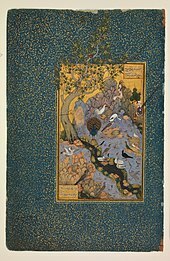 The arts of the Safavid period show a far more unitary development than in any other period of Iranian art. 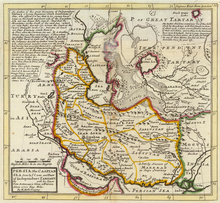 The Safavid Empire was one of the most significant ruling dynasties of Iran. 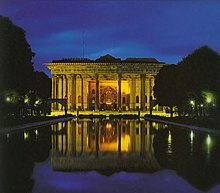 They ruled one of the greatest Persian empires, with artistic accomplishments, since the Muslim conquest of Persia. Pari Khan Khanum was a Safavid princess, the daughter of the Safavid king (shah) Tahmasp I and his Circassian consort, Sultan-Agha Khanum. An influential figure in the Safavid state, Pari Khan Khanum was well educated and knowledgeable in traditional Islamic sciences such as jurisprudence, and was an accomplished poet. 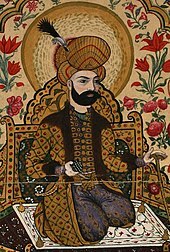 Abu'l Ghazi Sultan Alqas Mirza, better known as Alqas Mirza, was a Safavid prince and the second son of king (shah) Ismail I. 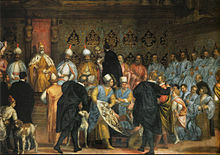 In early 1546, with Ottoman help, he staged a revolt against his brother Tahmasp I, who was king at the time. 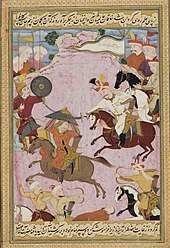 The qurchis or qorchis were the royal bodyguard of the Safavid shah. 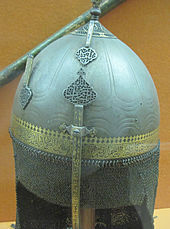 The head of the qurchis was known as the qurchi-bashi. 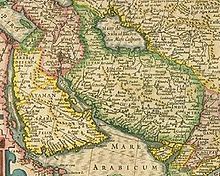 The province of Georgia was a velayat (province) of the Safavid Empire located in the area of present-day Georgia. The territory of the province was principally made up of the two subordinate eastern Georgian kingdoms of Kartli and Kakheti and, briefly, parts of the Principality of Samtskhe. The city of Tiflis was its administrative center, the base of Safavid power in the province, and the seat of the rulers of Kartli. It also housed an important Safavid mint.